Ages ago I found out about the Hypnocube. And recently I’ve actually managed to buy a version. 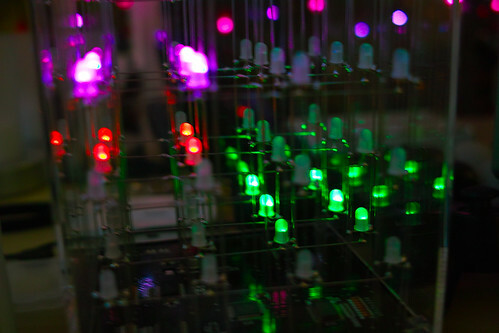 If you are wondering what they are, they are made from a cube of 4x4x4 multi-coloured leds soldered to steel wires as you can see above. There are a number of projects for making them and now you can even buy them from Firebox in the UK, although they are a bit more expensive than the price I paid. They go through a very impressive animation session that runs for around 90 minutes or so. What I want now is an 8x8x8 one…..